DECIDE >> I'd known I wanted this tattoo for roughly 2 years, but it took me a while to decide on placement. Did I want it on show or hidden away? What part of my body? Facing what direction? I ended up drawing the design on different parts of my body with a pen, and eventually I decided on the inside of my right arm, around about my wrist. Deciding whether to have my tattoo facing towards me or away from me was what I struggled with a lot. I found that online, there were loads of people saying that it's stupid to have a tattoo facing yourself, as it means you can't show it to other people. While I get that, and I think it's true for larger pieces, I knew that mine was going to be quite dainty and that it was very personal to me. In the end, I decided to get it facing me. I love it this way, and to be quite honest the design still looks lovely "upside down". BOOK >> I think I was more scared about booking my tattoo than actually getting it! My boyfriend Liam and I were getting tattoos together (not matching!) so we headed to what is regarded the best place in Dundee... And we were told extortionate prices and that we'd have to wait about 3 months for an appointment. We decided against it, found another place in town via Facebook, and sent them a message asking if we could come and chat to them. We both loved the artwork we could see on Facebook, and also sent over the designs we wanted via Messenger. After talking with them, we headed to their shop a few days later and got booked in for a couple weeks away! Both Liam and I were getting tattoos of things that we had already found online, so I can't offer advice on having designs drawn up. I also want to stress that we weren't being cheap - we both truly felt that because the designs we wanted were very small and simple, we didn't need to wait for months to get the city's top artist when there are plenty of other options available. APPOINTMENT >> Liam was the first out of the two of us to get his tattoos done, and so I was just sat in the little waiting area. I was sitting on my phone and making sure to take sips of water so I was well hydrated. I'd also eaten a good breakfast (it was 11AM) beforehand. Once it was my turn the artist showed me the design on paper to check it was exactly what I wanted, and once I said yes, he transferred it to my skin. Don't be afraid to be hyper-critical at this point - I had to tell him to move the stencil a couple of times until it was exactly where I wanted it. Then it was just a case of me sitting still as he got on with the job. My tattoo is only small, so it took about eight minutes and it was done! straight after getting it done - a little red and raised but not sore! 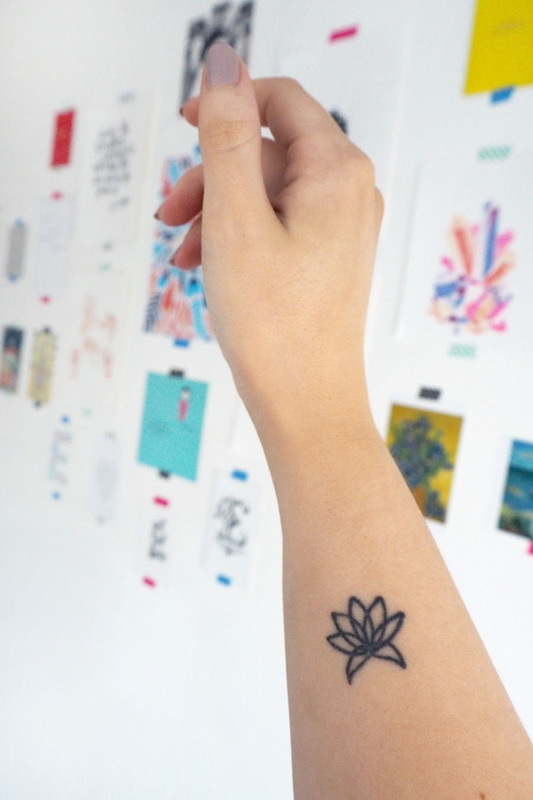 PAIN >> I didn't find getting my little lotus flower sore, at all. Mine is placed on the inside of my arm very close to the wrist, so I had come to believe that it was going to be very sore. However, there was honestly no problem. 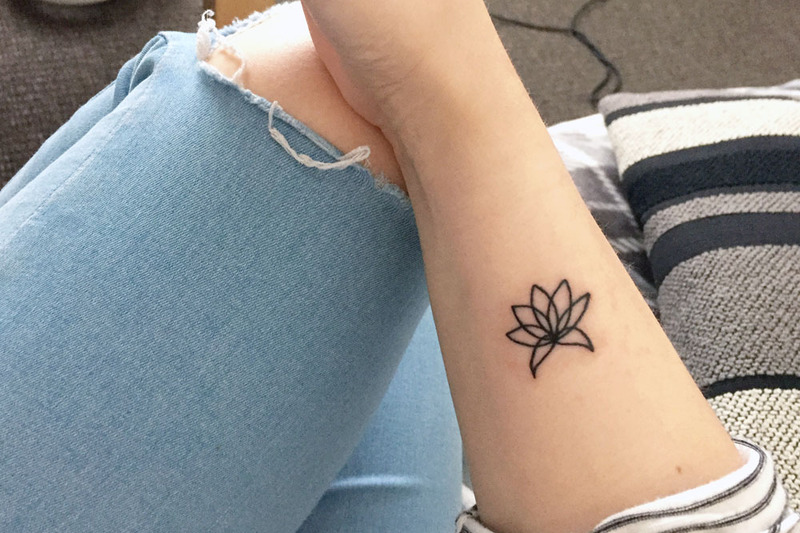 Maybe it's because I have a high pain threshold and my tattoo is so tiny, but I wouldn't describe the experience as painful at all. My tattoo artist did ask at one point if I was finding it painful and when I said no, he did say he'd thought so as it was so small and made up of only line work. It was like someone was scratching at my arm - not painfully, but annoyingly. Even Liam who had a tattoo directly on his wrist agreed with me - either people are exaggerating or we were lucky sods. AFTERCARE >> For aftercare, I'm not going to bother going into a huge amount of detail as there is way too much conflicting advice and I'm sure I'll get someone telling me I did something wrong. Your tattoo artist will provide you with aftercare details and I stuck to what mine told me and everything worked out great. The only thing I would advise is keeping it well hydrated - mine only itched a little for one day and I think it's because I never let it dry out, by using the treatment given to me repeatedly throughout the day and just drinking lots of water too. It also didn't itch or flake too much, but I think that's (again) because it's so small and formed of lines rather than any block colour. From two weeks, it had finished flaking, and by three weeks it had completely healed. Please remember that this is my own tattoo experience, something which is different for everyone. I've told you what worked for me, and I think it's important to stress that I didn't experience any pain or panic about every single thing that I did. Don't let the internet tell you that you should be scared about such a fun part of life! If you have any other questions or want to know something I may have left out, then leave a comment below or tweet me, and I'll be more than happy to help.